2005 Nitro 1900 Bay Tunnel, 2005 Nitro 1900 Bay Tunnel powered by a Mercury 90HP saltwater 2 Stroke, complete with matching trailer. Thanks to its NITRO-engineered V-design hull with a unique five-inch pocket tunnel at the rear, the purposeful NITRO BAY 1900 T center console runs shallower than comparable models. Its unusually wide 99' beam makes it as stable and confident as larger boats, while using less horsepower and fuel. Lighter weight from its slip-resistant gel coat interior gives it a performance edge over heavier liner models. 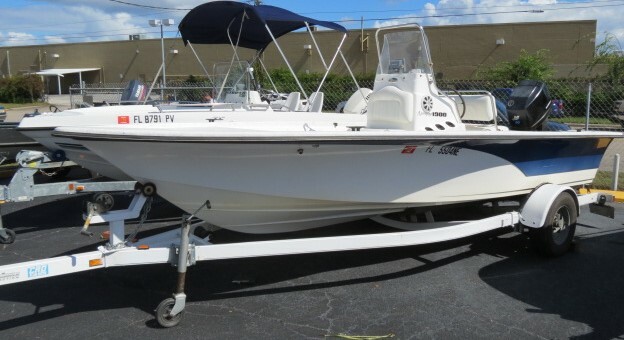 Package includes a Mercury Pro Series outboard, elevated bow/aft decks, closed bow storage, forward cushion-top storage boxes, aerated cushion-top livewell, stainless steel cushion-grip steering wheel, flush-mount vertical rod holders, flip-flop helm seat with 94-quart cooler below and a low-maintenance, easy-to-clean interior. Custom-matched trailer w/EZ lube hubs, galvanized wheels and GalvaShield frame.